Hi Friends! Do you love burlap?? I definitely do! It’s one of the easiest and cheapest ways to add farmhouse feel to your home. There are so many ways to use it and one of my favorites is to heat press vinyl on burlap to create cute signs. I am in the middle of remodeling my master bedroom… Yay! I want our decor to represent my hubby and I, and it doesn’t get much easier than whipping up a sign with our names on it. This post is part of another edition of a Craft Lightning challenge hosted by Angie from The Country Chic Cottage, Carolina from 30MinuteCrafts, and Beth with CreativelyBeth. board or wood – I got this board that said “Spring” on it, in a clearance bin at Marshalls for $2! Clearance stuff is always worth a look to go through. It’s so easy to paint or put fabric over items to make them say different things! The first thing you’ll want to do is cut your burlap to the size you want it. The easiest way to cut burlap is by pulling out strings to show you where a straight line is. There’s a quick video at the top of the post on how I cut and fray burlap. Burlap fits perfectly on board! Then you’ll need to design your names or saying in Cricut Design Space. I used MF I Love Glitter font. If you just open the text in CDS, you’ll notice that there are spaces between the letters. You can ungroup and move them closer or decrease the letter space. However, I find it easiest to write the names in the FontLab Pad app since it combines the letters together. Then I just save it and upload it to CDS. Now it’s perfect and it took much less time! Click “Make It”, click on “Mirror” and cut it on “Iron on” setting. Weed all the extra vinyl. I love my heat press but you could easily use an iron. I set my heat press to 285 F and press for 15-20 seconds. I first fold my burlap in half and press to get the middle line. Then I fold my iron on in half to get a crease and then I line up the two so I know that it’s centered. Press it and then peel off the plastic backing! If it is not sticking, press again before you peel it off. Mine adhered perfectly the first time. Once I peel off the backing, I like to place a teflon sheet over the burlap and press once more for 20 seconds. Then use a tape glider, glue gun, or glue dots to adhere the burlap to the board. That’s it! Super easy and fast way to apply vinyl on burlap. If you want a few other ideas on how to add burlap to your decor, you can check out the following posts by clicking on the pictures! If you’d like to learn how easy it is to paint on burlap, click here! Grab these free cut files and make your own wood box by clicking here! Make an easy and frugal Christmas sign with this free cut file! Easily apply burlap to candles to add farmhouse style! 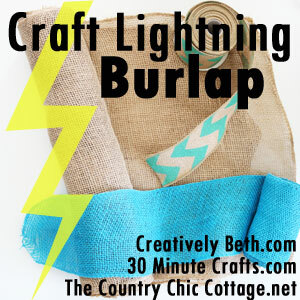 If you’d like even more burlap ideas, make sure to check out all the other crafts in this Craft Lightning burlap challenge! Great sign Amy, love that font! Lovely sign Amy! Thanks for joining us!